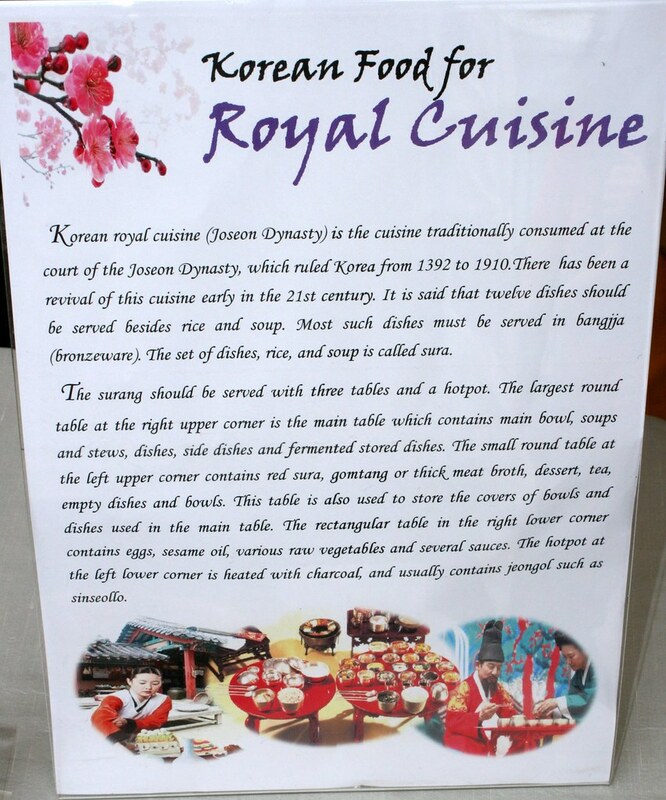 The Korea Festival 2008 had a small exhibit on royal Korean cuisine. Here are the dishes they showcased. 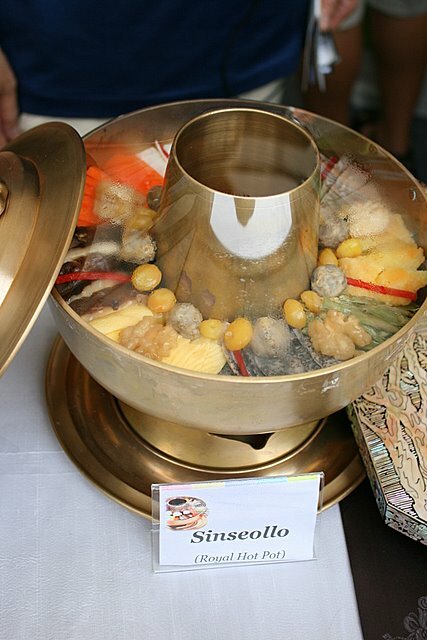 Sinseollo, a royal hot pot brimming with ingredients. 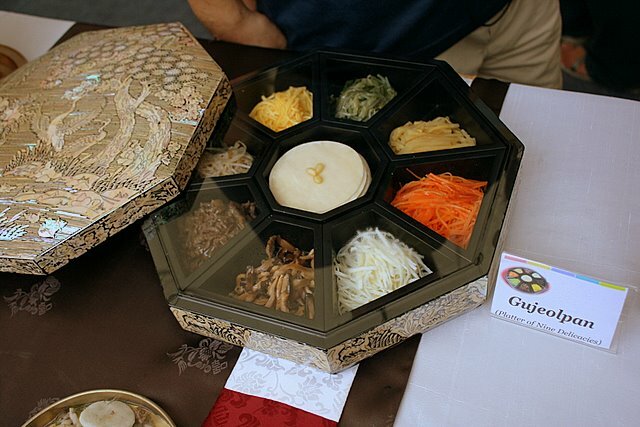 Gujeolpan - - platter of nine delicacies. Looks like dough wrappers in the center with assorted fillings on the side. 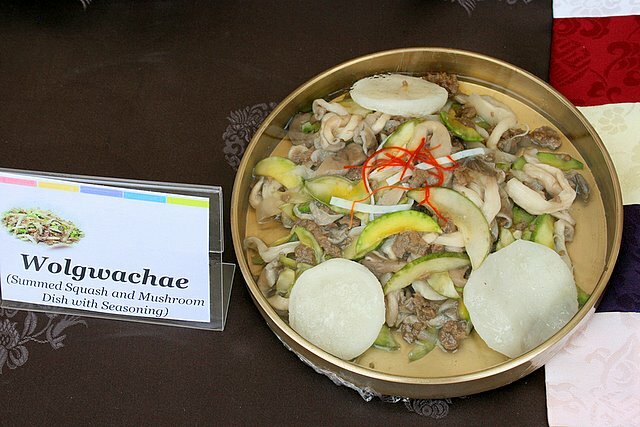 Wolgwachae - summer squash and mushrooms with seasoning. 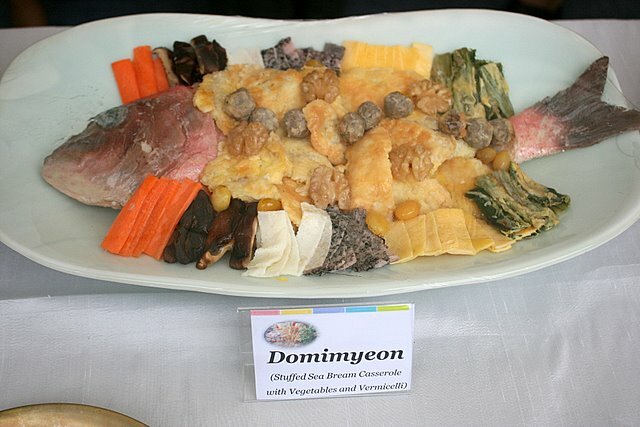 Domimyeon - stuffed sea bream casserole with vegetables and vermicelli. 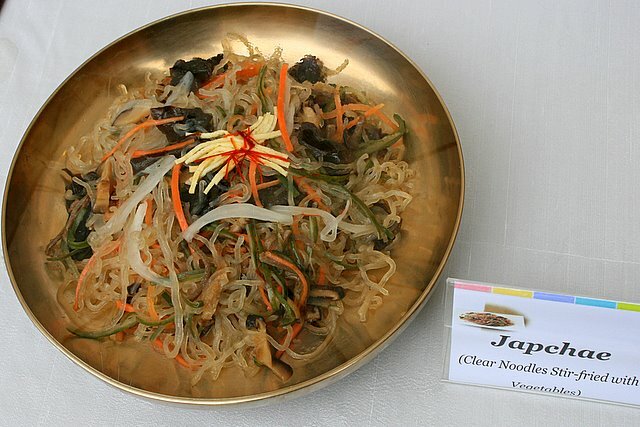 Japchae - clear noodles stir-fried with vegetables. Sounds like a variation of the Chinese "chap-chye" (mixed vegetables)! 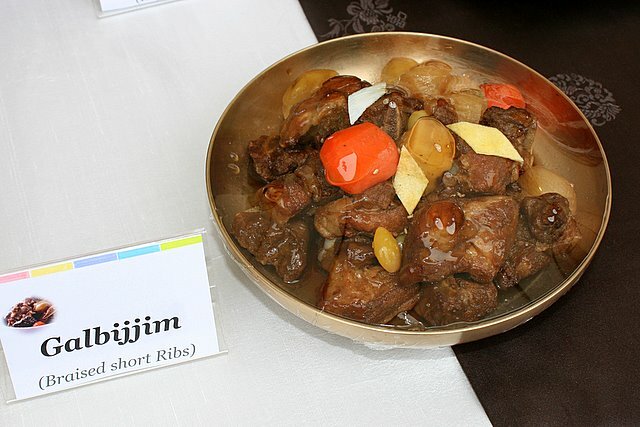 Galbijjim - braised short ribs. Galbi = karubi! Looks like "pai kuat wong" (sweet and sour pork ribs). Yummy. 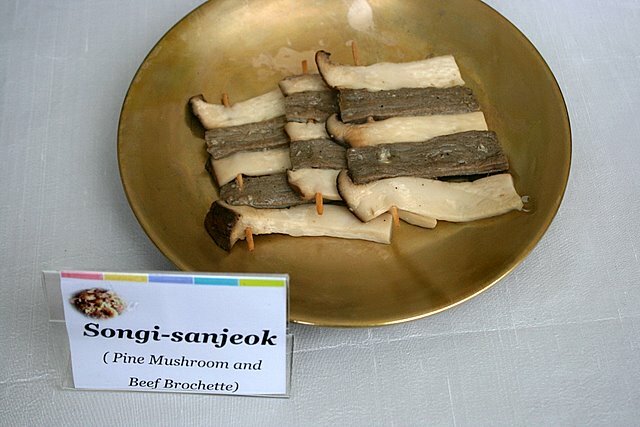 Songi-sanjeok - pine mushrooms and beef brochette. 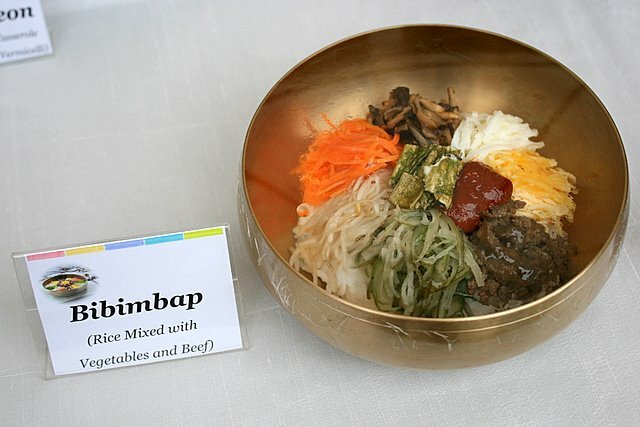 Bibimbap - rice mixed with vegetables and beef. I didn't know this was a royal thing. Probably the only dish I have tasted before out of all the ones above. Oddly, hubby's colleagues in Seoul say this dish is no longer popular in Korea! Their description of royal cuisine. Click if you need an even bigger photo for the text. Tomorrow: food by the seasons - what they eat in spring, summer, autumn, winter, and why. Seriously - their dishes also don't appeal me. But I hope you have an educational knowledge for this.